Fitzwilliam College is on the north-west side of Cambridge, between Huntingdon Road and Madingley Road, a few minutes' walk from the town centre. The College has made every effort to ensure that the directions below are up to date, but in the case of public transport it is advisable to check with the service provider, on or near to the day of travel. The Cambridgeshire County Council website provides full details of local bus routes and times and an interactive map of all Cambridge bus stops. The MyBusTrip app also provides real-time bus information for Cambridge and Cambridgeshire. National Express coaches stop at Parkside in Cambridge city centre and at the Madingley Road Park & Ride (not at the Drummer Street Bus Station). Put Fitzwilliam's postcode - CB3 0DG - to the National Express Stopfinder and you will see both locations in relation to the College. Taxis can be found at Drummer Street Bus Station, not far from the Parkside stop. From the North: Access by road from the North is via the A1 to Huntingdon, then A14 and A1307 (Huntingdon Road) into Cambridge. Fitzwilliam is approximately two miles from the A14 on your right. From the East: Using the A14 take the B1049 exit towards Cambridge. At the end of Histon Road turn right and right again at the traffic lights into Huntingdon Road. Fitzwilliam is approximately 200 metres on your left. From the South: Leave the M11 at Junction 13 and drive along Madingley Road towards Cambridge. After Churchill College, turn left into Storey's Way. Fitzwilliam is on your right after the first corner of Storey's Way. From the West: Join either the M11 or A14 and follow directions as above. 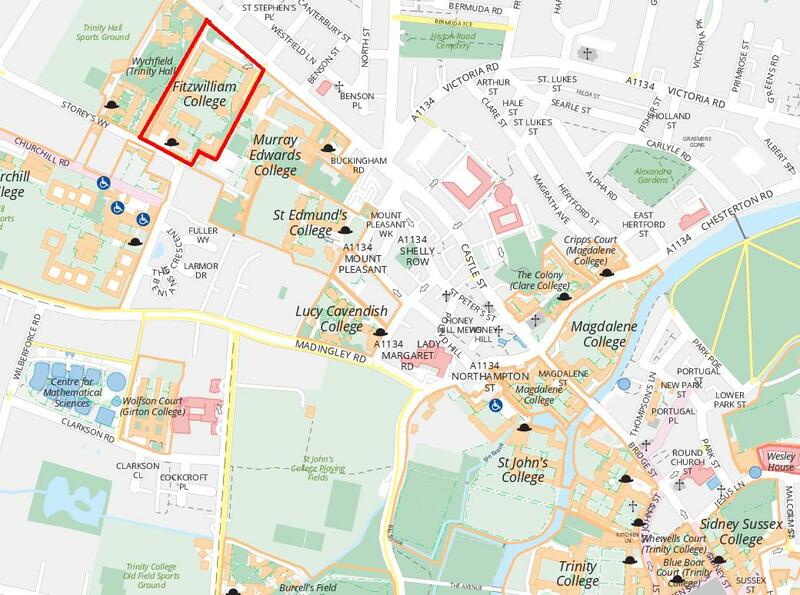 Parking: Fitzwilliam College has two car parks, one at the main (south) entrance on Storey's Way, the other on Huntingdon Road (north entrance). If you are a visitor and wish to use the car park please report to the Porters' Lodge on Storey's Way. If you are a conference guest you must speak to your conference organizer. The College operates a clamping scheme for any unregistered vehicles. In addition, street car parking is available along Storey's Way by the College entrance. There is a frequent train service to London (Liverpool Street and King's Cross). The fastest service takes 52 minutes, and at peak times there are seven trains per hour. The train station is situated to the south of Cambridge city centre. The town centre is approximately halfway between the station and Fitzwilliam College. The College can easily be reached using taxis or buses: the 'City Rail Link' bus departs the station every ten minutes, taking you to the city centre. On foot the journey to the College then takes around 15 minutes. International flights: The UK map (above) shows the location of major airports. 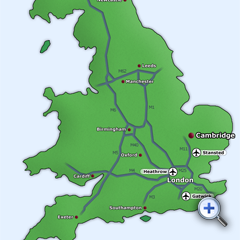 Of the London airports the most convenient is Stansted, as it is only 25 miles along the M11 from Cambridge. 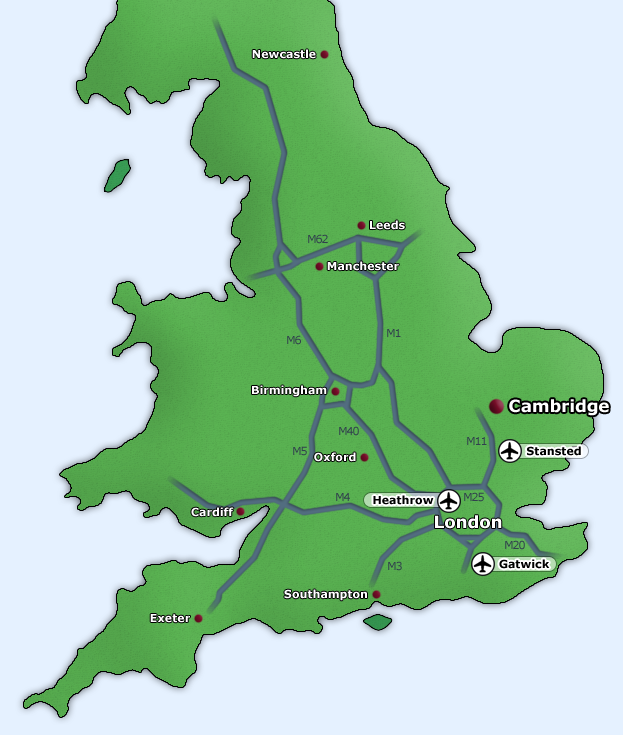 Coaches and trains can be taken from the airport to Cambridge. From Gatwick and Heathrow, head for King's Cross to take a train to Cambridge, or for Victoria to use the coach station. You are advised to enquire upon arrival at the airport as to the most efficient route to Cambridge. National flights: Cambridge aiport is on the west side of the city; the University's map of Cambridge (linked above) shows the location. You are advised to enquire at the airport whether there is currently any public transport running to Huntingdon Road.